REMASTERED on Blu-ray for the first time! Thirteen inches with an attitude! Brick Bardo (Tim Thomerson) is a traveler from outer space who is forced to land on Earth. Though regular sized on his home planet, he is doll-sized here on Earth, as are the enemy forces who have landed as well. While Brick enlists the help of an impoverished girl and her son, the bad guys enlist the help of a local gang. When word leaks out as to his location, all hell breaks loose. Brick is besieged by an onslaught of curious kids, angry gang members, and his own doll-sized enemies, and he must protect the family who has helped him and get off the planet alive. 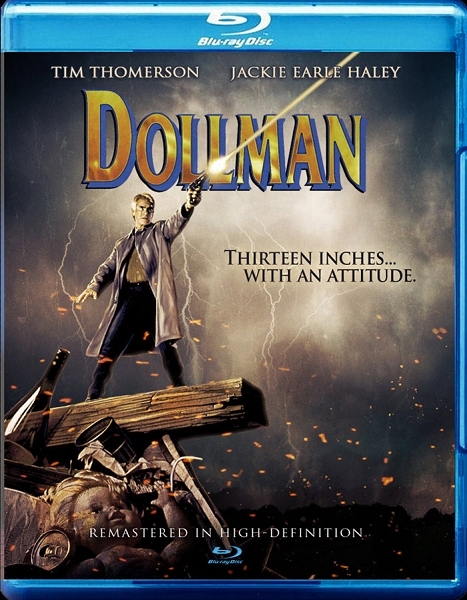 The remastered edition of Dollman looks better than ever! An ALBERT PYUN Film "DOLLMAN"